I was so excited to interview Foy Ford at the Strand Theater, home of the Swamp Fox Players. Foy has been the theater manager for eleven years. Thanks to Penny Thomas Barbour and Jamie Sanderson, I was able to sit down and talk to her about this historical building in Georgetown. Historically speaking, Wilson B Arnholter built and introduced the theater as the Peerless to a packed house on June 24, 1914, and thereafter, closed the place down. When another theater in Georgetown, the Princess Theater, burned down in 1916, Wilson B. Arnholter reopened his building as the Princess Theatre. History shows the Abram Brothers named it once again as the Peerless in 1929. 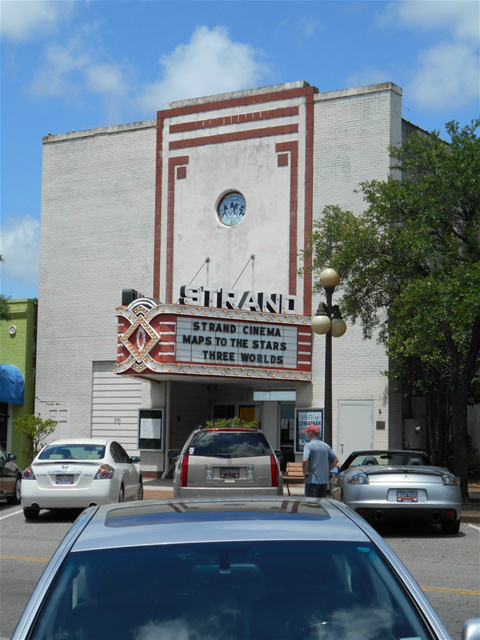 The building was later renamed the Strand Theater. In 1964, the theater reopened under new management and, unlike the movies and plays performed at this time; the theater only showed films as a cinema in the past. “Where at down the street,” I asked Foy as we seated ourselves in one of the chairs several rows from the stage. They recently had The Legend of Bagger Vance on the marquee (which is the original marquee) and currently, Still Alice will be showing as the acting group prepares for their next performance of Bye, Bye Birdie. “Tell me about the ghost,” I asked getting more excited. With a nod she answers, “Yes they did. There was another incident where we were all meeting across the street after rehearsal. One of the actresses stayed behind to take off her makeup. She was here alone, by herself. While looking up the Strand Theater on the internet, I searched for the pictures and one thing is for sure, Foy Ford is right. In every picture, not only is the marquee the same, but just above it, you can see the double masks, as well. Thank you Foy for allowing me to come inside and talking to me about this beautifully magnificent place called, the Strand Theater.